People in a lift (elevator for those who speak American) fall into two broad groups; the first group walk into the car, push the button they want and wait for the control systems to do their job. Others believe that the more they push the buttons the more likely the elevator is to respond. In reality the vast majority of control systems log the first call and then optimise the movement of the elevator to meet all of the different calls from different levels of the building. The second and subsequent ‘button pushes’ add no value at all. In an elevator, ABPS makes no difference and anecdotally I understand many ‘close door’ buttons have no wiring behind them, they are in the lift simply to make people with ABPS feel in control even if they are not. ABPS in the workplace is an altogether different issue. When a project is running behind time, overrunning costs, or experiencing other difficulties; the equivalent of the elevator being slow to respond; many managers demand additional meetings, more frequent reports and other responses from the project team that consume time and money that could be better spent working on the project deliverables. These project resources are being diverted to placate the manager’s ABPS to the detriment of the project. This phenomenon has been recognised for some considerable time without the underlying syndrome being defined. Cohn’s Law states: The more time you spend in reporting on what you are doing, the less time you have to do anything. Stability is achieved when you spend all your time reporting on the nothing you are doing…… (this should not be confused with Cole’s Law which is thinly sliced cabbage!). Unfortunately, when the project is eventually delivered, the manager’s ABPS is reinforced because obviously all of the extra reports and meetings helped achieve the outcome; unfortunately correlation is not the same as causation! There is no easy way of measuring how much sooner the project would have finished if the resources had not been diverted by ABPS, but the manager feels ‘in control’. This is not a clear cut situation, frequently there is need for better information to base decisions on (see more on decision making). However, it is easy to slip from requesting useful information that will help inform decisions (useful information is useful because it is used) into ABPS where the requested reports and meetings are actually counterproductive and make the situation worse. So next time you are considering requesting more reports or extra meetings think about ABPS, will the diversion of resources from the project’s work to respond to your requests be constructive or detrimental? There’s no easy answer to this question! If you are a victim of your managers ABPS the only antidote is to try and make the person with ABPS aware of the resource being consumed by their ‘syndrome’. A temporary solution may be to identify your version of the unconnected ‘close door’ button where the manager feels in control but there is minimal to no effort expended in response to the button pushing. For more thoughts on ‘Advising Upwards’, my new book will be published mid year. Wisdom is a state of the human mind characterised by profound understanding and deep insight. It is the consciousness of wholeness and integrity that transcends rules, often referred to as common sense in an uncommon degree. 2400 years ago, Aristotle identified two types of wisdom – the esoteric/metaphysical and practical wisdom – more recently psychologist and author, Barry Schwartz has been discussing the importance of Practical Wisdom (see the book) and the ‘right way to do the right thing’. Aristotle believed that to do the right thing, and ultimately to be happy, required you to be a person with the right character – courage, honesty, perseverance, etc; but that having these virtues wasn’t enough, because, you need to decide how courageous should you be and when to be courageous? You need to use your judgment. And the virtue of good judgment is what Aristotle called practical wisdom. Practical wisdom is knowing when and how to display the other virtues and how to choose when two virtues or requirements conflict. Whilst rules are important in the governance of organisations they are not enough. Practical wisdom requires the use of wise improvisation! In the service of the right aims, the wise person will ‘bend the rules’ in the service of good. As the proverb suggests: Rules are for the guidance of wise men and the blind obedience of fools. Or more usefully, Rules are for the obedience of the inexperienced and the guidance of wise men. (WW2 British RAF Ace, Sir Douglas Bader). What this means is standard conduct is justified in most situations. However, the rules should not be followed blindly particularly where following the rules will cause disadvantage or be detrimental to a key objective. In these circumstances, there may be a more effective procedure. Effective leaders need the moral skill and the moral will to improvise effectively at the appropriate times. Virtue and wisdom are almost inseparable. The challenge facing organisations and society at large is that developing wise people requires a degree of freedom to make mistakes and learn. This freedom is progressively eroded as the reaction to each unvirtuous action is almost universally the creation of new rules and the removal of the freedom to make judgements. Unfortunately, rules will never constrain the actions of the unvirtuous. The ISO Technical Management Board has approved the proposal submitted last summer by ANSI and BSI to create a new ISO Technical Committee for Project, Programme, and Portfolio Management, TC258. The ANSI (USA) will provide the secretariat for TC258 and the BSI (United Kingdom) will provide the chairmanship. The Project Committee, PC236, I have been involved with over several years focuses on a single standard and its work on ISO 21500 – Guide to Project Management is nearing completion with final publication expected in 2012. The purpose of a Technical Committee is to address a complete domain of interest and will expand on the work to deliver 21500 to develop a range of standards at both the technical level and in allied disciplines such as program and ‘project portfolio’ management. I believe this is a positive step towards the emergence of project management as a global profession. There’s a long way to go to develop a business plan and then develop a range of useful standard but the journey has begun! The Eastern states of Australia were at the end of a 10 year drought (although we did not know it then), and governments were committing $billions to desalination plants, pipelines and other water conservation measures and wondering if they would be completed in time to stop major cities running out of drinking water. Fast forward 23 months and we have just experienced some of the wettest months on record. Unusually, the rain is persistent, heavy and widespread. 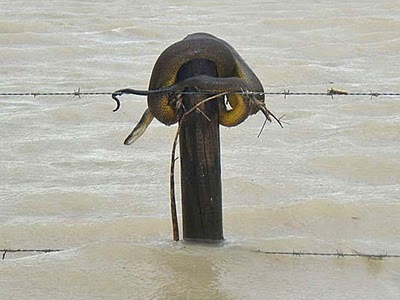 The flooded areas extend more than 2000Km from Central Queensland to Victoria and the weather is not letting up for another two to three days at least. Dozens of people have died, 1000s of homes and businesses are damaged or destroyed, farms wiped out and food production disrupted. Similar but less extreme damage has also occurred in the North of West Australia. 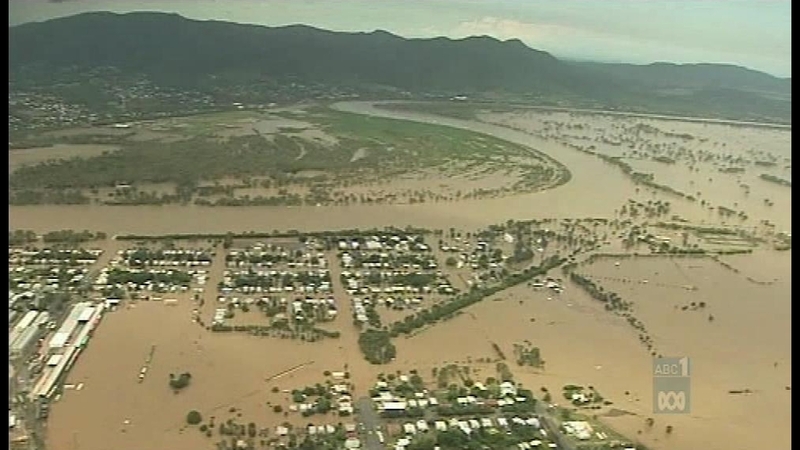 For more on the floods see: 24/7 Queensland floods info centre. Any donations will be appreciated. What seems to be happening with the effects of global warming is the droughts are getting longer hotter and dryer and the ‘flooding rains’ more intense and widespread. Whilst ‘on average’ the rainfall of the last decade may only be a bit less then usual, and ‘on average’ the temperatures only a little higher than usual, the extremes are becoming far more damaging and far more common, and far less ‘normal average’ weather is occurring. As these changes become better understood, there is likely to be major changes needed in the ways we live, work and manage risks; all of which will have a major impact on projects of all types and sizes. How do you make a sensible allowance for inclement weather when the mutually exclusive options are no rain for a year and a 10 foot deep flood across the site? The old weather data is almost meaningless. This volatility seems to be extending into costs, exchange rates, and many other factors that used to be ‘reliably predicted’ even if confidence in the ‘reliable estimate’ was somewhat misplaced. The world is definitely changing, the management challenge is to keep up. 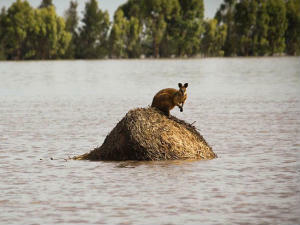 Whilst you are pondering this – click on the flood link above and donate. Wherever you live it may not be too long before you need the favour returned – even our ‘tough locals’ need help. A number of years ago, Paul Dinsmore quoted a trainee who defined a stakeholder as ‘one who holds the beef’. In many situations, a fairly accurate description! During a trip to Paul’s second home in Rio de Janeiro last year, my wonderful hosts from PMI Rio, introduced me to professional steak-holders…… and the steak was good! Which more than anything else defines the problem with communicating in English. Communication is not that simple even when using basic words sometimes spelled different but pronounced the same, stake -v- steak. Sometimes spelled the same but pronounced differently. Whilst you are mulling over this I will just take a minute to polish the Polish pewter I intend to present to a friend as a present (ie, give as a gift). One of the key themes in my new book Advising Upwards is the different ‘languages’ used by managers at different levels of an organisation. Communicating effectively is a skilled art that needs practice and you need to speak in the language of the listener to achieve the greatest effect. Mosaic is offering a world-first integrated scheduling course for the PMI Scheduling Professional (PMI-SP) and CIOB Project Time Management Certificate (PTMC). The total course comprises 13 modules of focused schedule training. Modules 1 to 6 provide the education needed for the new CIOB Project Time Management Certificate (PTMC) examination. Modules 1 to 5 plus Modules 7 to 13 provide the education needed for the PMI-SP credential. All of the modules are available via Mosaic’s Mentored Email™ delivery allowing schedulers to prepare for their examinations anywhere, any time. Additionally, Modules 1 to 4 are incorporated into Mosaic’s successful 1 Day and 2 Day scheduling workshops. The 1 Day workshop is exclusively focused on the exam-prep modules, the 2 Day workshop covers a range of additional scheduling and time management topics. Bookings for this exciting range of courses are open with module delivery scheduled from the 1st March for the Mentored Email™ courses. The first 1 Day workshop focused on the new courses will be held on the 12th April in Melbourne with others to follow. Details of our one-on-one Mentored Email™ course are at http://www.mosaicprojects.com.au/Training-Planning_One-on-One.html. If you wish to buy a copy of The Guide in advance of the course, see: http://www.mosaicprojects.com.au/Book_Sales.html#CIOB – your course fees are reduced if we don’t have to ship books. If you are a consultant or a trainer, dump clients who don’t pay their bills and/or don’t follow your advice. Send them to your competition. Let deadbeat clients bankrupt your competitors and blame them for failing to follow your advice. You go to the cardiologist, and he tells you to lose 10 kilos, give up smoking and get more exercise. You don’t follow his advice and you end up dying of a cardiac infarction. Who is responsible? Clients who don’t follow your advice are a danger to your reputation. Avoid them like the plague.